Download "Study Guide. for the Life Insurance Exam. License Exam Manual. InsurancePro QBank. 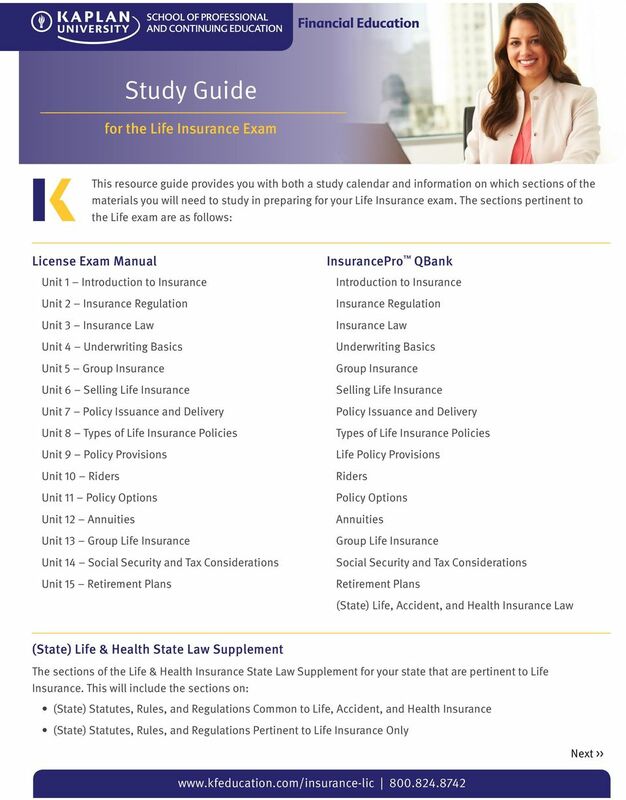 (State) Life & Health State Law Supplement"
3 Life Only Insurance Exam Study Guide Days to complete this program: Minimum 3 Maximum: 26 Important Information Check the Updates/Addendums and Corrections sections on your online access page regularly throughout your study to ensure you have the most current information about the exam you re studying for. Guide Details Session 1 Most sessions last about 1-1 ½ hours, except for those sessions involving final practice exams. To help you stay on track, be sure to check off each box when you complete each session. The Video and Audio assignments refer to tools available in the Premium and Essential Packages. Unit reading assignments refer to the License Exam Manual and/or Online Course. If applicable, schedule your insurance licensing class. Make sure you are aware of any pre-study hours your state may require prior to attending the class. If applicable to your state, review your State Syllabus and Cross Reference to make sure you are studying the applicable material for your exam. Familiarize yourself with the License Exam Manual and review the Glossary Terms towards the back of the manual. View the Instructional Demos located in the right-hand column of your Online Access Home page to learn how to utilize the various online study materials. 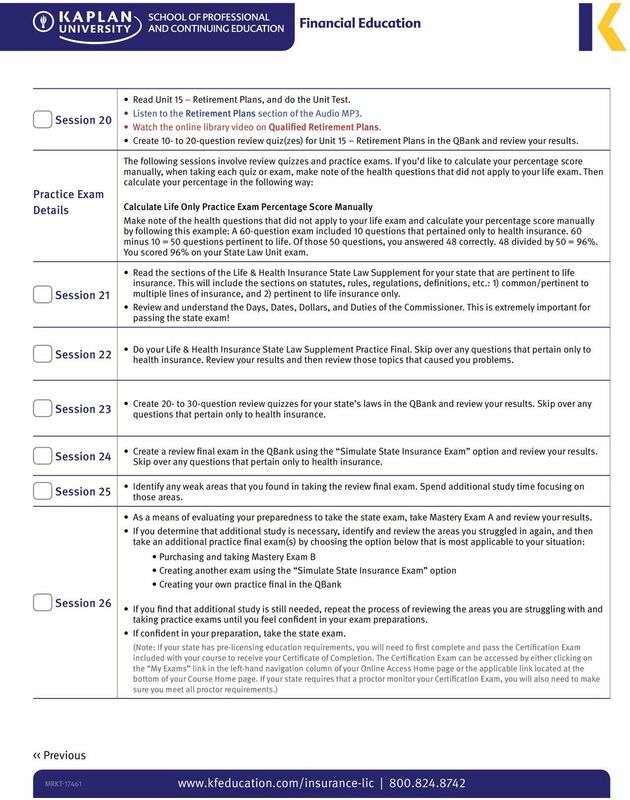 Session 2 Read Unit 1 Introduction to Insurance, and do the Unit Test. Listen to the Introduction and Introduction to Insurance sections of the Audio MP3. Watch the online library videos: Introduction to Insurance Part 1 and Introduction to Insurance Part 2. Create 10- to 20-question review quiz(zes) for Unit 1 Introduction to Insurance in the QBank and review your results. Session 3 Session 4 Session 5 Read Unit 2 Insurance Regulation, and do the Unit Test. Listen to the Insurance Regulation section of the Audio MP3. Create 10- to 20-question review quiz(zes) for Unit 2 Insurance Regulation in the QBank and review your results. Read Unit 3 Insurance Law, and do the Unit Test. Listen to the Insurance Law section of the Audio MP3. Watch the online library video on Insurance Law. Create 10- to 20-question review quiz(zes) for Unit 3 Insurance Law in the QBank and review your results. Read Unit 4 Underwriting Basics, and do the Unit Test. Listen to the Underwriting Basics section of the Audio MP3. Create 10- to 20-question review quiz(zes) for Unit 4 Underwriting Basics in the QBank and review your results. Session 6 Session 7 Read Unit 5 Group Insurance, and do the Unit Test. Listen to the Group Insurance section of the Audio MP3. Create 10- to 20-question review quiz(zes) for Unit 5 Group Insurance in the QBank and review your results. Read Unit 6 Selling Life Insurance, and do the Unit Test. Listen to the Selling Life Insurance sections of the Audio MP3. Watch the online library video on Selling Life Insurance. 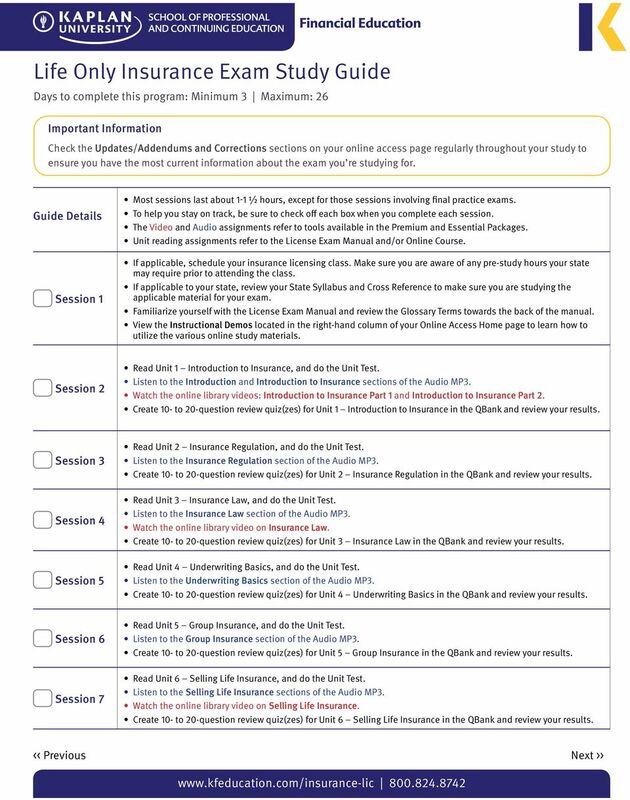 Create 10- to 20-question review quiz(zes) for Unit 6 Selling Life Insurance in the QBank and review your results. 4 Session 8 Session 9 Read Unit 7 Policy Issuance and Delivery, and do the Unit Test. 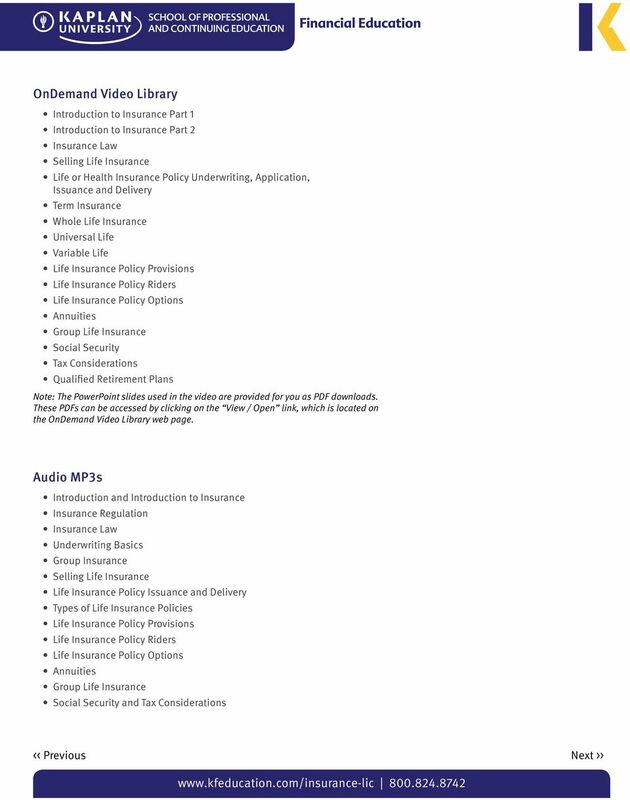 Listen to the Life Insurance Policy Issuance and Delivery section of the Audio MP3. Watch the online library video on Life or Health Insurance Policy Underwriting, Application, Issuance and Delivery. Create 10- to 20-question review quiz(zes) for Unit 7 Policy Issuance and Delivery in the QBank and review your results. Read Unit 8 Types of Life Insurance Policies, and do the Unit Test. Listen to the Types of Life Insurance Policies section of the Audio MP3. Session 10 Watch the online library videos on Term Insurance, Whole Life Insurance, and Universal Life. Session 11 Session 12 Session 13 Session 14 Session 15 Session 16 Session 17 Session 18 Session 19 Watch the online library video on Variable Life. Create 10- to 20-question review quiz(zes) for Unit 8 Types of Life Insurance Policies in the QBank and review your results. Read Unit 9 Policy Provisions, and do the Unit Test. Listen to the Life Insurance Policy Provisions section of the Audio MP3. Watch the online library video on Life Insurance Policy Provisions. 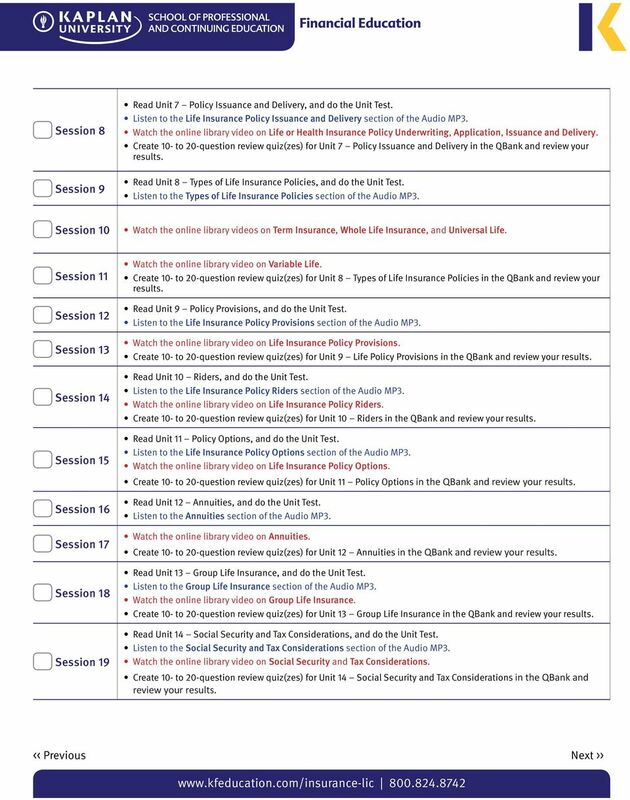 Create 10- to 20-question review quiz(zes) for Unit 9 Life Policy Provisions in the QBank and review your results. Read Unit 10 Riders, and do the Unit Test. Listen to the Life Insurance Policy Riders section of the Audio MP3. Watch the online library video on Life Insurance Policy Riders. Create 10- to 20-question review quiz(zes) for Unit 10 Riders in the QBank and review your results. Read Unit 11 Policy Options, and do the Unit Test. Listen to the Life Insurance Policy Options section of the Audio MP3. Watch the online library video on Life Insurance Policy Options. Create 10- to 20-question review quiz(zes) for Unit 11 Policy Options in the QBank and review your results. Read Unit 12 Annuities, and do the Unit Test. Listen to the Annuities section of the Audio MP3. Watch the online library video on Annuities. Create 10- to 20-question review quiz(zes) for Unit 12 Annuities in the QBank and review your results. Read Unit 13 Group Life Insurance, and do the Unit Test. Listen to the Group Life Insurance section of the Audio MP3. Watch the online library video on Group Life Insurance. Create 10- to 20-question review quiz(zes) for Unit 13 Group Life Insurance in the QBank and review your results. Read Unit 14 Social Security and Tax Considerations, and do the Unit Test. Listen to the Social Security and Tax Considerations section of the Audio MP3. Watch the online library video on Social Security and Tax Considerations. Create 10- to 20-question review quiz(zes) for Unit 14 Social Security and Tax Considerations in the QBank and review your results. Supplement to AGENDA ITEM 18.F. & 18.G. First Certificate in English Online Practice Test Free Sample How to complete the FCE Online Practice Test Free Sample: Writing Welcome to the First Certificate in English Online Practice Test Free Sample. Nearpod instructions REGISTER FOR NEARPOD. 1) Register for an account at www.nearpod.com. Download the Nearpod app onto device(s).